Kelli Allen is an award-winning poet and scholar. Her work has appeared in The Blue Sofa Review, WomenArts Quarterly, The Caper Review, It Has Come to This: Poets of the Great Mother Conference, Foliate Oak, Greatest Lakes Review, Lugh Review (where she was the featured author), Blackmail Press, Puerto del Sol, The Chaffy Review, Euphony and elsewhere. She is the author of two chapbooks (Applied Cryptography; Picturing What Breaks) and has served as the Managing Editor of Natural Bridge. Allen also serves as Director of Development for The Missouri Warrior Writers Project, which serves United States Veterans as they attempt to tell their stories through poetry and creative non-fiction. She is also the founder and director of the Graduate Writers Reading Series for the University of Missouri-St. Louis. Allen gives readings and teaches workshops throughout the US. This poem is restless in the most literal sense: constant movement framed by the idea of exile, itself the absence of a place to rest. But that’s not something you’ll understand from the ‘facts’ of this poem – instead it’s in the feelings the images evoke. Allen is asking her reader to step outside the customary use of language into a world made entirely of metaphor. She’s asking us to set aside our literal expectations, to join the poem’s collective voice as “we” alternately pursue (hunter and hermit) or are pursued (by the horse) across border after border. It’s not necessary to decode every statement. What is necessary are repeated readings over time to allow the implications of, say, eggs that are also “dark stones” to slowly reveal themselves. It’s a poem to savor. Archetypal figures like the Hunter and Hermit deserve an archetypal typeface like Van Dijk. Its been a favorite choice for book length work for centuries because it’s clean serifs and graceful ascenders & descenders allow the reader’s eye to float along each line, undistracted. 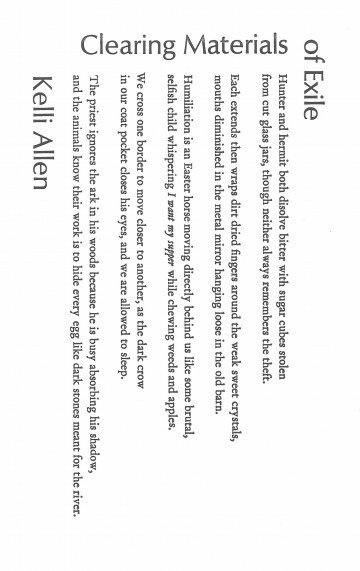 That’s a plus with a poem like Allen’s which asks the reader to take a little leap of faith, to trust that a meaning can be divined via emotion instead of a sensical story. Optima is another classic, favored by the Roman Catholic church for its missals. It fits with both the priest of the last stanza and the open ended seeking of all the figures in this poem. Wrapping the title around the poem’s body creates a border to echo those skirted and transgressed in the poem.